Body slips for nearly any 12"-22" dolls. 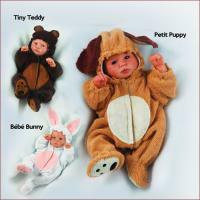 The extra soft texture from the suede-like fabric adds even more realism to your adorable newborn. This cuddly body makes your newborn baby huggably soft and gives the added air of quality to a doll you've worked so hard to create. Our imitation suede body slip is the most popular in the industry. The Secrist suede-like body makes your newborn baby huggably soft and gives the added air of quality to a doll you've worked so hard to create. 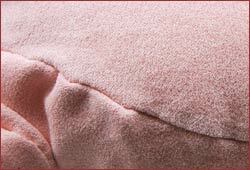 Close-up of the suede-like cuddly body showing the extra soft texture. This body slip does not include the vinyl arms, legs or head. Attach whatever vinyl limbs that you would like. The slips are jointed in the shoulders and hips and cable ties are included with each body slip as well. Many people find vinyl parts from other manufacturers and then use them on our cloth body slip because of our quality and proper body size. Ty-wraps included. Arms, legs and head not included. These cloth body slips does not include the vinyl arms, legs or head. Attach whatever vinyl limbs that you choose! These body slips are jointed in the shoulders and hips. Cable ties are included with each body slip as well. Many people find vinyl parts from other manufacturers and then use them on our cloth body slip because of our quality and proper body size. To simplify the ordering process for you doll kits and body slips are sold separately. Use our custom made cloth bodies and attach whatever vinyl limbs you choose! The cotton body slip is jointed at the shoulders and hips. All body slips include preinserted cable ties.